MicroRNAs in Medicine provides an access point into the current literature on microRNA for both scientists and clinicians, with an up-to-date look at what is happening in the emerging field of microRNAs and their relevance to medicine. Each chapter is a comprehensive review, with descriptions of the latest microRNA research written by international leaders in their field. 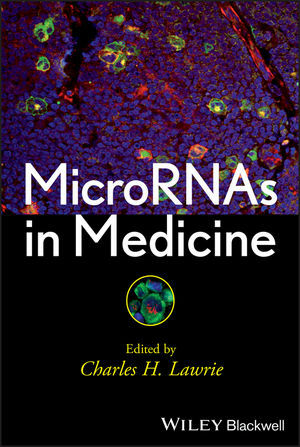 Opening with an introduction to what microRNAs are and how they function, the book goes on to explore the role of microRNAs in normal physiological functions, infectious diseases, non-infectious diseases, cancer, circulating microRNAs as non-invasive biomarkers, and finally their potential as novel therapeutics. Including background information on the field as well as reviews of the latest research breakthroughs, MicroRNAs in Medicine is a one-stop source of information to satisfy the specialists and non-specialists alike, appealing to students, researchers, and clinicians interested in understanding the potential of microRNAs in medicine and research. Dr. Charles Lawrie is Director of Oncology at the Biodonostia Institute in San Sebastián, Spain. The author of numerous research papers and book chapters, Dr. Lawrie is an Associate Editor for the Journal of Cancer Research, and serves on the editorial boards of a number of other prestigious journals including Cancers, Journal of RNAi and Gene Silencing, American Journal of Blood, and ISRN Hematology.